With some forty issues of Bird Scene under our belts I am really pleased with the progress that has been made with this e-magazine. 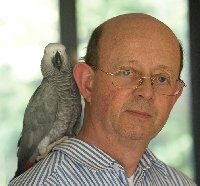 For seventeen years I have edited the Parrot Society magazine which has been very interesting but from its very nature is limited to parrot species excluding the Budgerigar. Bird Scene allows me to study and enjoy all the other species of birds that are kept within UK aviculture many of which are exhibited at The National Exhibition which will again be held at Stafford on Sunday 6th October 2019. In fact one of the major objectives of Bird Scene is to publicise The National Exhibition and the bird clubs who have joined with The Parrot Society to allow their members to exhibit birds in a large exhibition. I keep Cape Doves, Java Sparrows, Gouldian finches and Forbes Parrot-finches all of which have their own individual needs and challenges and give me great pleasure to maintain, not to show standard but good aviary birds. There is no doubt that to breed a nest of healthy youngsters of any of these four species gives great satisfaction and all the time I am increasing my knowledge of my charges. Current editions for 2018-2019 or on the active page, while past issues may be seen in the archived files.